Maruti is building a crossover version of the next-generation Ertiga (code-named YHB) MPV for the Indian market. It is expected to be launched in India during 2019. The new crossover could be called the Ertiga Cross or Ertiga X. Here is a render showing what the new Maruti will look like. As the render shows, expect muscular looks. Maruti is likely to use a lot of cladding around the vehicle to make it look more rugged. New front and rear bumpers, a honeycomb grille, blacked out bits and bumper insert at the front and the rear could be the styling changes. Apart from these changes,the new crossover may get a higher ground clearance. It will be based on the next-generation Ertiga, which means that it will use the HEARTECT platform. This platform is already used on cars like the Baleno and the new Dzire. This platform saves weight without compromising on strength by using high tensile steel. The new Ertiga and its crossover derivative are expected to be lighter, more fuel efficient and peppier to drive. Like the new Ertiga, the crossover is expected to use a new range of petrol and diesel engines. The petrol engine is likely to displace 1.5 liters and will be first seen on the Maruti Ciaz Facelift. The engine – newly developed in-house by Suzuki – will be more powerful than the current Ertiga’s 1.4 liter K-Series petrol. This means outputs greater than 94 Bhp and 130 Nm. The diesel engine will also be an all-new unit, again displacing 1.5 liters. Unlike the petrol, the diesel engine will be turbocharged. We expect at least 100 Bhp and 220 Nm from the new diesel engine, making it a clear step above the current 1.3 liter Fiat Multijet diesel (89 Bhp-200 Nm) that the Ertiga uses. The new Ertiga range will also be front wheel driven, with a monocoque chassis. We expect both the new Ertiga and its crossover sibling to get manual and automatic gearboxes on both petrol and diesel engines. 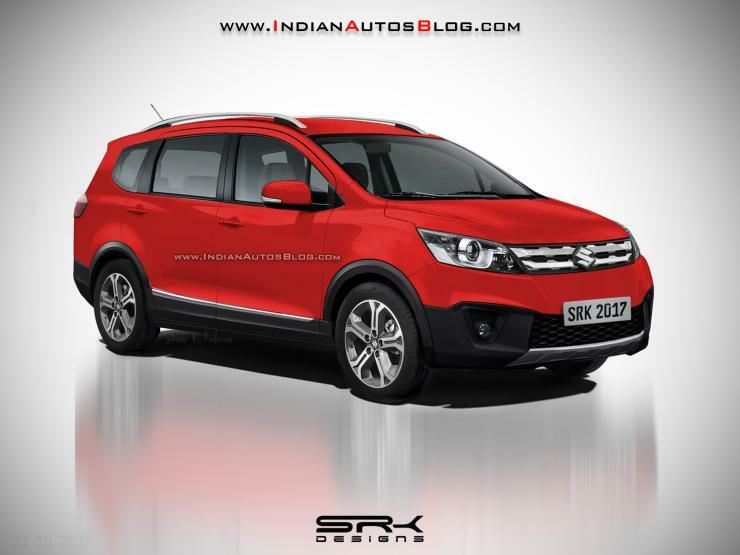 The vehicles will have seating capacity for seven, and will be larger than the current Ertiga. This is expected to make the interiors more spacious. The crossover is likely to be priced higher than the MPV version, but not by much.